This machine is designed with the principle of overflow and vacuum suction, which can achieve fill level consistency effectively. 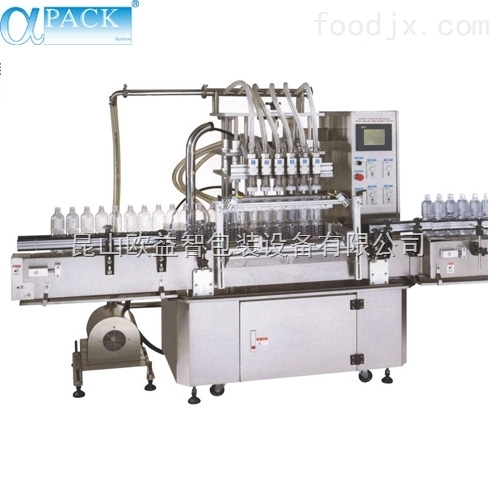 This machine is very suitable for various low viscosity or rich forming products, which makes them ideal filling machines for the condiment, wine, pharmaceutical, and daily chemical industries. Machine construction in Stainless Steel #304. Fill level is determined by the depth of the overflow mouth inside the neck of the bottle so the filling volume can be adjusted easily. Overflow filling system prevents spillage during filling. No change parts are required for different bottle sizes. No bottle, no filling safety device. All contact parts made of Stainless Steel #316.